Image: Odin Mine seen from the end of the road. 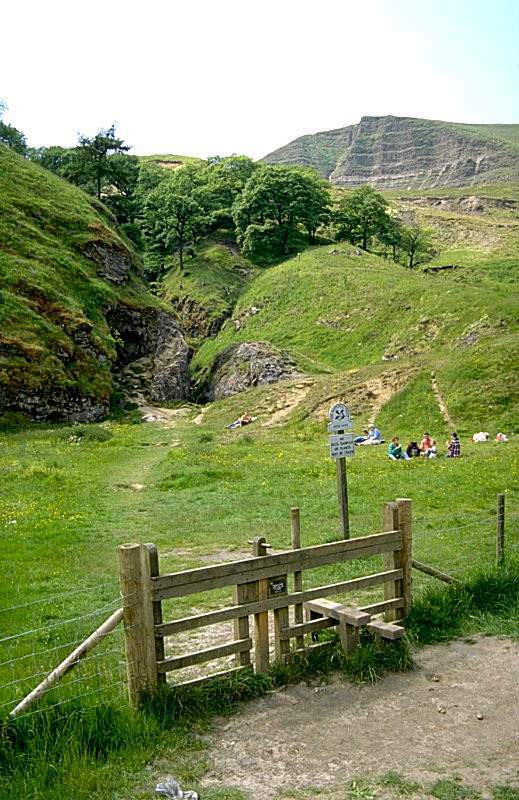 Location: At the end of Hope Valley, 2km W of Castleton, Peak District. 25km from Sheffield, 45km from Manchester. Bibliography: Trevor D. Ford and James H. Rieuwerts (1976): Odin Mine, Castleton, Derbyshire, Peak District Mines Historical Society Bulletin, Volume 6 Number 4 - September 1976. Address: Owner: The National Trust, Regional Office, Clumber Park, Stableyard, Worksop, Nottinghamshire, S80 3AZ, Tel: +44-11909-486-411. This is an open air site with the remains of an old ore crushing circle, complete with its gritstone wheel. 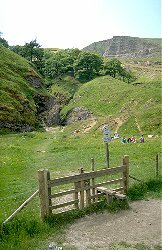 Nearby is Knowles Shaft, now capped and the main rake or open cast workings can be seen heading up the hill towards Mam Tor for over half a kilometre. On the opposite side of the road, to the north, there are two openings, a 2 metre high circular entrance is Odin Cave and the gash in the cliff next to it is the opening to Odin Mine. The working are very deep and dangerous and should not be entered, even by expert cave explorers. 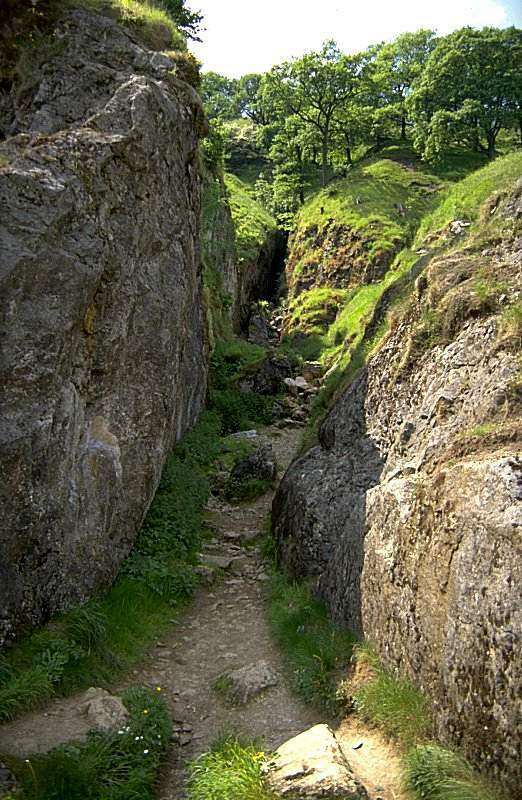 The working are very extensive and go as far as Tinker's Shaft, now covered by the road in front of Blue John Caverns. Odin Mine is probably the oldest lead mine in Derbyshire and its name suggests is was worked in Roman times and it was certain active in the Saxon era. Unfortunately today thieves abound in the area, and any equipment left lying around will be quickly stolen.